It was demonstrated that long non-coding RNAs occupied an important position in tumor pathogenesis and progression. We have previously found that the metastasis-associated lung adenocarcinoma transcript 1 (MALAT-1) promotes cell proliferation and metastases in pancreatic ductal adenocarcinoma (PDAC). The present study was aimed to discuss the underlying mechanisms. Bioinformatics method was used to identify the miRNA target of MALAT-1. Expressions of relative genes were assessed by quantitative real-time PCR and western blotting, respectively. Sulforhodamine B assay and Transwell assay were employed to detect cell proliferation, migration and invasion, respectively. Moreover, RNA immunoprecipitation was performed to determine whether RNA-induced silencing complex contained MALAT-1 and its potential binding miRNA. Luciferase assays was used to confirm potential binding site. Bioinformatics search predicted that miR-200c-3p was a direct target of MALAT-1. Further, we found a reciprocal suppression between MALAT-1 and miR-200c-3p expression. In terms of mechanisms, high MALAT-1 and low miR-200c-3p may form a novel feedback loop. On the one hand, MALAT-1 functioned as a competing endogenous RNA to suppress miR-200c-3p expression, leading to upregulation of ZEB1 expression. On the other hand, miR-200c-3p inhibited the level of MALAT-1 expression was in a way similar to miRNA-mediated downregulation of target genes. Clinical data further indicated that MALAT-1 and ZEB1 expression was negatively correlated with miR-200c-3p transcript level of PDAC tissues. There was a positive correlation between MALAT-1 and ZEB1 level. MALAT-1 (high)/miR-200c-3p (low) correlated with shorter overall survival of PDAC patients. Multivariate analysis revealed that both MALAT-1 and miR-200c-3p levels were independent prognostic factors. Our findings firstly revealed a novel feedback loop between high MALAT-1 and low miR-200c-3p. Targeting the feedback loop between high MALAT-1 and low miR-200c-3p will be a therapeutic strategy for PDAC. Pancreatic ductal adenocarcinoma (PDAC) is considered to be one of the most lethal tumor worldwide  and will become the second leading cause of tumor-associated mortality in the USA by 2030 . In spite of rapid progress in understanding PDAC tumorigenesis at the molecular level and therapeutic approaches, the prognosis of PDAC remains poor, with a 5-year survival rate less than 5% . PDAC is insensitive to chemotherapy and radiotherapy, meaning the identification of novel therapeutic targets is imperative. Non-coding RNAs (ncRNAs) are not transcribed and translated into coding-proteins, including micro-RNAs (miRNAs) and long non-coding RNAs (lncRNAs) . LncRNAs have attracted increasing attention in recent years due to important biological effects in carcinogenesis and progression [5, 6]. In recent years, a large number of lncRNAs, such as MALAT-1, HOTAIR, H19 and PVT1 appear to play important roles in PDAC development, as it regulates cell growth, progression and chemo-resistance, etc. . We have previously found that the MALAT-1 promotes tumor growth and metastases in PDAC [8, 9]. However, the underlying molecular mechanisms still need to be further clarified. Recently interaction research between lncRNAs and miRNAs is attracting an increasing amount of attention . In this study, we revealed a reciprocal suppression between MALAT-1 and miR-200c-3p expression in PDAC, and performed underlying mechanisms analysis. The present study was approved and supervised by the Ethics Committee of the Renji Hospital, School of Medicine, Shanghai Jiaotong University. Written informed consent was obtained from all subjects. Sixty-five paraffin embedded samples were collected from the Surgery Department, Renji Hospital, School of Medicine, Shanghai Jiaotong University from January 2009 to December 2012, and were histopathologically confirmed and staged in accordance with the Union for International Cancer Control. The follow-up data was ended in December, 2017. Human pancreatic ductal cells (HPDE) and PDAC cell lines SW1990, CAPAN-1, HS-766 T, CFPAC-1, BxPC-3, AsPC-1 and PANC-1 were all obtained from Chinese Academy of Sciences Cell Bank (Shanghai, China). SW1990 cell was cultured in L-15 medium supplemented with 10% fetal bovine serum (FBS, all purchased from Gibco, Grand Island, NY, USA), and grown in room temperature air. The other cells were cultured in RPMI 1640 supplemented with 10% FBS (all purchased from Gibco, Grand Island, NY, USA), grown at 37 °C in 5% CO2 saturated humidity. The miRNeasy FFPE Kit (QIAGEN, Hilden, Germany) kit and miniBEST universal RNA extraction kit (Takara Bio, Dalian, China) was used to extract total RNA from tissue samples and cultured cells, respectively. Reverse transcription and RT-qPCR kits were employed to examine MALAT-1 and miR-200c-3p level. RT-qPCR reactions were performed by the ViiATM 7 system (Applied Biosystems Inc. Foster City, CA, USA). The primers used in the reaction for MALAT-1, miR-200c-3p, ZEB1, GAPDH and U6 were purchased from Tiangen (Tiangen, Beijing, China). GAPDH and U6 were detected as the endogenous control to normalize the expression levels of the different genes. Comparative threshold cycle (Ct) (2-ΔΔCt) method was selected to calculate relative expression. Cell proliferation was measured via the sulforhodamine B assay. Cells were seeded in 96-well plates and transfected with miR-200c-3p nc, miR-200c-3p inhibitor, or mimics and cultured for 24, 48, 72, and 96 h. Using microtiter plate reader (VERSMax), optical density (OD) values were measured at 560 nm. Invasion assays were conducted 24 h after transfection. Briefly, 1 × 105 cells in serum-free media were seeded into the upper chamber of an insert (8.0 μm, Millipore, Billerica, MA, USA) that was coated with Matrigel (BD Biosciences, Franklin Lakes, NJ, USA) . Then, 10% FBS-containing medium was placed in the lower chambers of the insert. After incubation for 24 h, the invaded cells were fixed and stained using 0.1% crystal violet staining solution. Finally, the cells were counted by a microscope at a magnification of × 200 in five randomly selected fields. Migration assays were similar to the above-mentioned assay but no Matrigel was used. RIP assay was performed by the Magna RIP™RNA-Binding Protein Immunoprecipitation Kit (Millipore, Billerica, MA, USA). Cells were lysed in RIP Lysis Buffer. MiR-200c-3p and MALAT-1 were immunoprecipitated with AGO2 antibodies. The complexes that bound on the magnetic beads were immobilized and unbound materials were washed off. Then, miR-200c-3p and MALAT-1 were extracted and analyzed by RT-qPCR. Firstly, 293 T cells were seeded in 24-well plates and transfected with 50 nM miR-200c-3p mimics or miR-200c-3p nc respectively. Secondly, after 24 h transfection, the above 293 T cells were then transfected with 100 ng luciferase reporter vectors that contained either wild-type (MALAT-1-wt) or mutant types (MALAT-1-mut) (both were designed and structured from Obio Technology, Shanghai, Corp. Ltd). The Renilla luciferase reference plasmid was included in each transfection system as an internal control to normalize the transfection efficiency. Finally, at 48 h after transfection, the Dual-Luciferase Reporter Assay using an illuminometers (Promega Corporation, Madison, WI) was performed according to the manufacturer’s protocol. Western blot analysis was conducted as previously described . The primary antibodies were as follows: anti-AGO2 (1:1000), anti-ZEB1 (1:1000, Cell Signaling Technology, Beverly, MA, USA), and anti-β-Actin (1:2500, Santa Cruz Biotechnology, Santa Cruz, CA, USA). Recombinant plasmid pcDNA3.0/ZEB1, miR-200c mimic, miR-200c inhibitor, siRNA against MALAT-1, and negative controls were all obtained or constructed from GenePharma (Shanghai, China). The detail sequences were under Additional file 1. Lipofectamine 2000 (Invitrogen, USA) was used as transfections agents. Data were presented as the mean ± SE. All statistical analyses were conducted by SPSS statistical software 17.0 (SPSS Inc., Chicago, IL, USA). For comparison between two groups, we used two-tailed Student’s t test. Multiple group comparisons were calculated with one-way ANOVA analysis. Least-significant difference (LSD) was used for post hoc test. χ2 tests or Fisher’s exact methods was used to detect correlation between MALAT-1 level or miR-200c-3p and clinical characteristics, as appropriate. The correlation between MALAT-1, miR-200c-3p and ZEB1 expression was analyzed using Pearson Correlation. Kaplan-Meier method was used to estimate overall survival (OS). Univariate and multivariate COX regression analysis was performed. P < 0.05 was considered to indicate a statistically significant difference. To investigate the interaction among potential miRNAs and MALAT-1, we used the Starbase v2.0 (starbase.sysu.edu.cn LncRNA.php) to search for miRNAs that complementarily base-pair with MALAT-1. Twenty miRNAs were predicted to bind to MALAT-1 (see Additional file 2). We further validated 20 miRNAs expression after knockdown of MALAT-1 in CFPAC-1 and AsPC-1 cell lines, which showed relative high level of MALAT-1 (Fig. 1a and b). Initial profiling identified three miRNAs (miR-200c-3p, miR-92b-3p, and miR-181c-5p) that exhibited > 2-fold-change compared with the control (Fig. 1c and d; P < 0.05). Next, miR-200c-3p was chosen for the study because it showed the greatest fold-change in response to the MALAT-1 knockdown. Subsequently, to study the biological function of miR-200c-3p on PDAC, we transfected AsPC-1 and CFPAC-1 cells with miR-200c-3p nc, inhibitors, or mimics (Fig. 2a; P < 0.05). Sulforhodamine B assay showed that there were no differences of cell proliferation ability in different groups, including miR-200c-3p nc, inhibitors, or mimics group (Fig. 2b; P < 0.05). Transwell assay revealed that miR-200c-3p mimics transfection decreased the number of migrating cells in comparisons with that of miR-200c-3p nc, while transfection of miR-200c-3p inhibitor increased the number of migrating cells (Fig. 2c; P < 0.05). Taken together, miR-200c-3p suppressed cell migration and invasion in PDAC, but not cell proliferation. Our previous studies have revealed that MALAT-1 promotes tumor growth and metastases in PDAC [8, 9]. To further examine if the effects of MALAT-1 on cell migration and invasion were partially mediated by miR-200c-3p, we co-transfected CFPAC-1 and AsPC-1 cells with MALAT-1 siRNA and miR-200c-3p inhibitor. The results revealed that knockdown of MALAT-1 suppressed cell migration and invasion, whereas miR-200c-3p inhibition partially reversed decreased invasiveness (Fig. 3a and b; P < 0.05). These findings were also confirmed in PANC-1 and CAPAN-1 cell lines (see Additional file 3; P < 0.05). Together, the data suggested that miR-200c-3p can partially rescue the loss of MALAT-1-mediated PDAC cell migration and invasion. Among the many targets of miR-200c-3p, we focused on ZEB1 because it encodes a zinc finger and homeodomain transcription factor proteins that function in PDAC metastasis. Firstly, the result verified that the miR-200c-3p inhibitor triggered significant endogenous ZEB1 expression, whereas miR-200c-3p overexpression silenced ZEB1 protein expression (Fig. 4a; P < 0.05). Furthermore, cotransfection with MALAT-1 siRNA and miR-200c-3p inhibitor revealed that the miR-200c-3p inhibitor weakened down-regulation of ZEB1 by MALAT-1 knockdown (Fig. 4b; P < 0.05). Further study showed that ZEB1 overexpression can rescue the loss of MALAT-1-mediated repression activity in PDAC, including reduced cell migration and invasion (Fig. 5a, b, c and d; P < 0.05). 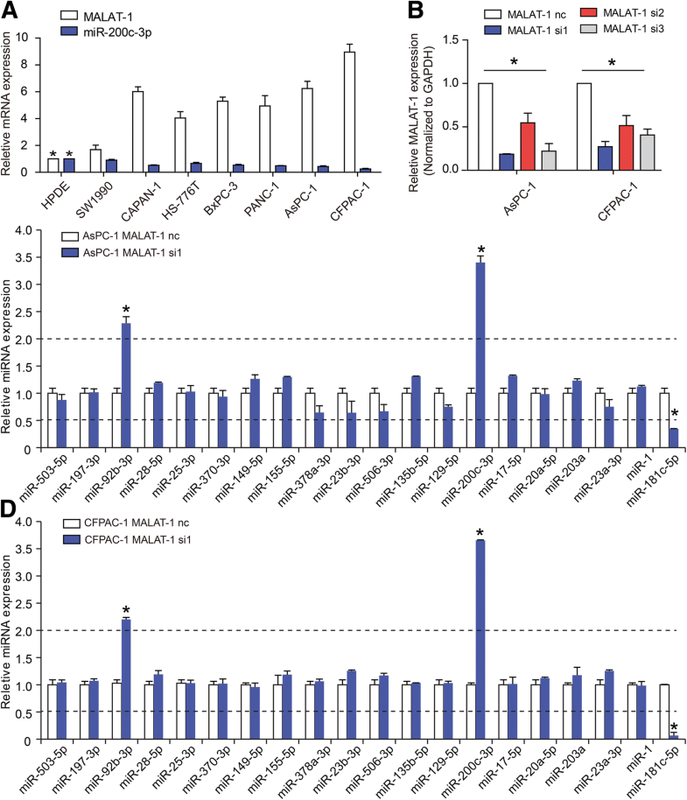 This experimental evidence supported that the observed migration/invasion defect in MALAT-1 knockdown or miR200c-3p mimics was in fact mediated via regulation of ZEB1 expression. We then measured MALAT-1 expression levels in response to transfection of miR-200c-3p mimic or inhibitor. The results showed that inhibiting miR-200c-3p up-regulated MALAT-1 levels (Fig. 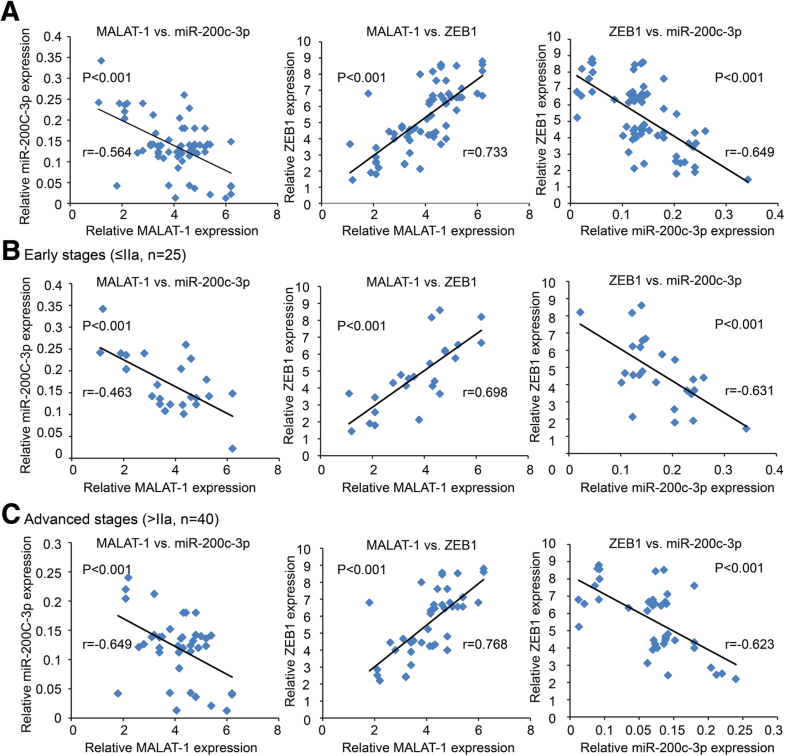 6a; P < 0.05), whereas miR-200c-3p overexpression significantly decreased MALAT-1 in both cell lines (Fig. 6b; P < 0.05). The data above implicated MALALT-1 was also a target of miR-200c-3p. 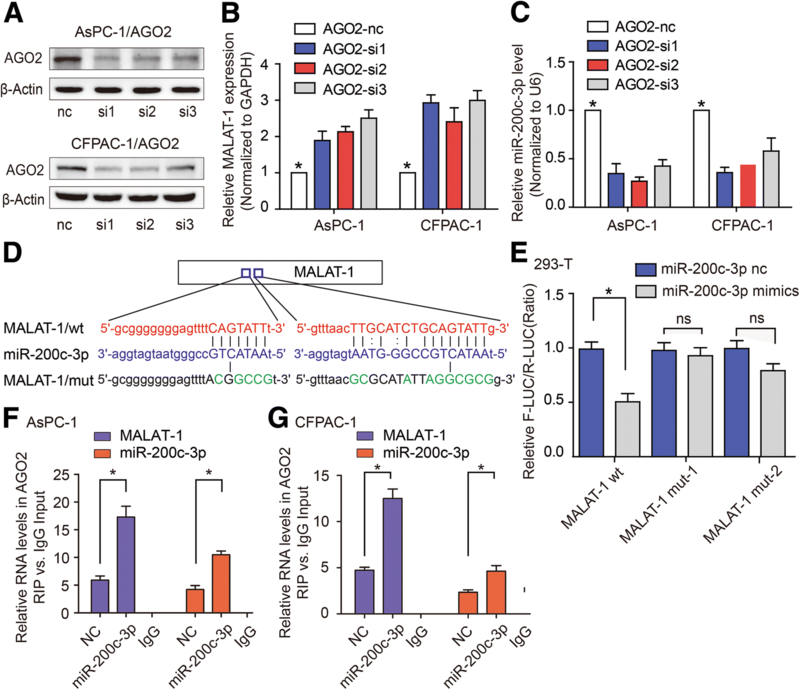 AGO2 is necessary for miRNA-mediated gene silencing . To investigate whether MALAT-1 expression is controlled by miR-200c-3p, we knocked down AGO2 in AsPC-1 and CFPAC-1 (Fig. 7a; P < 0.05). As expected, MALAT-1 expression was increased in AGO2-knockdown cells (Fig. 7b; P < 0.05). 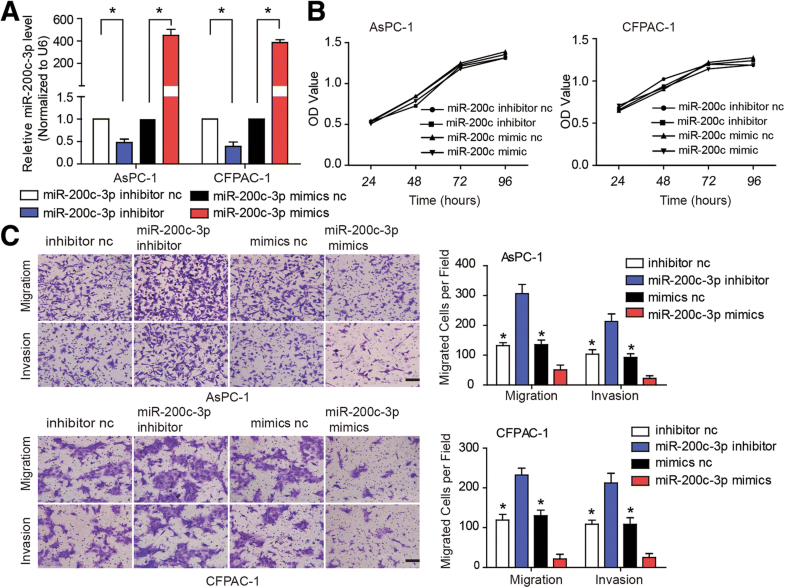 Also, the stability of miR-200c-3p was significantly impaired in AGO2-knockdown cells (Fig. 7c; P < 0.05). These data collectively suggest that miR-200c-3p directly regulates MALAT-1 levels. To further study the mechanism that underlies the negative regulation of miR-200c-3p by MALAT-1 and to obtain evidence that supports a potential interaction between these two genes, we used Starbase v2.0 to predict the interaction sites between miR-200c-3p and MALAT-1 (Fig. 7d), and cloned the two mutated binding sites to vector, respectively. The mutants were designated as pMALAT-1-mut1 and pMALAT-1-mut2 (Fig. 7d). Then, luciferase assays were performed in 293FT cells that were transfected with pMALAT-1-mut1 or pMALAT-1-mut2. The results showed that luciferase activity decreased in the pMALAT-1 WT group in 293 T-transfected miR-200c-3p mimics compared to control group (Fig. 7e; P < 0.05). However, there were no effects on the luciferase reporter activities of pMALAT-1 mut-1 and pMALAT-1 mut-2 (Fig. 7e; P < 0.05). Collectively, these results suggested that MALAT-1 was a direct target gene of miR-200c. Further, AGO2 RIP assay showed that transfection with miR-200c-3p mimics enriched MALAT-1 and miR-200c-3p in AGO2 immunoprecipitated from AsPC-1 (Fig. 7f; P < 0.05) and CFPAC-1 (Fig. 7g; P < 0.05) cell extracts. Collectively, these results were consistent with the hypothesis that MALAT-1 stability is AGO2-dependent and is regulated by miR-200c-3p in PDAC. We further evaluated the correlation between MALAT-1 and miR-200c-3p expression and the clinicopathological characteristics. The median value was used as cut-off to divide MALAT-1 or miR-200c-3p expression into low level group (n = 33) and high level group (n = 32). As shown in Additional file 4, MALAT-1 expression is strongly correlated to lymph node metastasis (P = 0.007) and clinical stage (P = 0.007). And miR-200c-3p expression was negatively correlated with gender (P = 0.011), lymph node metastasis (P = 0.017), and clinical stage (P = 0.017). Bivariate correlation analysis showed that expression of MALAT-1 and ZEB1 was negatively correlated with miR-200c-3p transcript level of PDAC tissues (Fig. 8a; P < 0.05). There was a positive correlation between MALAT-1 and ZEB1 level (Fig. 8a; P < 0.05). And this phenomenon was consistent at different clinical stages (Fig. 8b and c; P < 0.05). Kaplan-Meier analysis showed that patients with PDAC tumors expressing high MALAT-1 levels had significantly lower OS than those expressing low MALAT-1 (Fig. 9a; P < 0.001), whereas that patients expressing high miR-200c-3p levels had significantly higher OS than those expressing low miR-200c-3p (Fig. 9b; P < 0.001). To further investigate the correlation of OS with MALAT-1 and miR-200c-3p expression, the results showed that MALAT-1 (high)/ miR-200c-3p (low) associated with shorter OS of PDAC patients (Fig. 9c; P < 0.001). Using univariate analysis, in addition to clinical stage, both MALAT-1 (P < 0.001) and miR-200c-3p (P < 0.001) levels were closely associated with OS (see Additional file 5). Multivariate analysis revealed that both MALAT-1 (P < 0.001) and miR-200c-3p (P < 0.001) level was an independent prognostic factor for PDAC patients (see Additional file 5). Gathering evidence demonstrated that lncRNAs occupies an important position in cancer pathogenesis [4, 13]. Previously, we have outlined the functional lncRNAs in PDAC, such as MALAT-1, HOTAIR, H19 and HULC, and decipher possible mechanisms of lncRNAs . MALAT-1, one of the first lncRNAs, was demonstrated to be associated with lung cancer . Also, MALAT-1 has been linked to several other human tumor entities [15, 16]. In our previous studies, we have found that the MALAT-1 served as oncogenic lncRNA participating in PDAC cell growth and progression [8, 9]. However, the underlying molecular mechanisms are far from being fully elucidated. Amounting studies indicate that MALAT-1 could exert functions by targeting miRNAs. Han X et al. found that MALAT-1 modulated Srf through miR-133 and discovered a novel correlation among MALAT-1, miR-133, and Srf in myoblast differentiation. Lei R et al. revealed that high level of MALAT-1 promoted cell growth by targeting miR-506 in ovarian cancer. In our study, we found that MALAT-1 knockdown decreased the expression of miR-200c-3p in PDAC. On the other hand, miR-200c-3p mimic decreased the level of MALAT-1, while miR-200c-3p inhibitor upregulated MALAT-1 level. A luciferase assays further confirmed that MALAT-1 was a direct target of miR-200c-3p in PDAC. Subsequently, we discussed the mechanism of such a feedback loop. It was found that MALAT-1 and miR-200c-3p bind to the same RNA-induced silencing complex. Based on the fact that lncRNAs act as ceRNA to bind specific miRNAs and regulate their function [19, 20]. We supposed that MALAT-1 may inhibit miR-200c-3p expression in such way in PDAC. It was found that MALAT-1 could upregulate ZEB1 expression, which was a target of miR-200c-3p. Together, the above results further confirm our hypothesis. For another, miRNAs regulate protein-coding gene expression at transcriptional level through binding to the 3′-untranslated regions [21, 22]. Leucci E et al. found that miR-9 targeted the AGO2-mediated deregulation of MALAT-1 in the nucleus. Wang X et al. 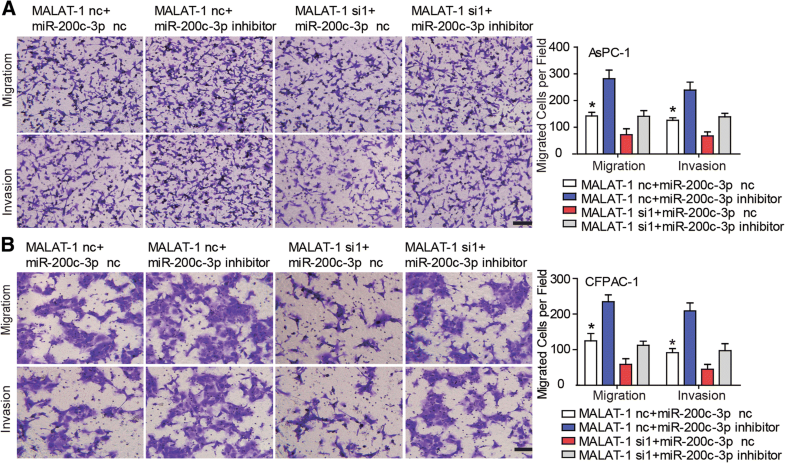 showed that posttranscriptional inhibitory mechanism of MALAT-1 by miR-101 and miR-217 suppressed cell proliferation, migration, and invasion in esophageal squamous cell carcinoma. We proposed that the way that miR-200c-3p inhibited the level of MALAT-1 expression is in a way similar to miRNA-mediated silencing of protein-coding genes. Our data were consistent with recent report in ovarian cancer . Hirata H et al. found that MALAT-1 promoted aggressive phenotype by interacts with miR-205 and EZH2 in renal cell carcinoma. Our previous study had demonstrated that MALAT-1 could recruit EZH2 to the E-cadherin promoter, where it repressed E-cadherin expression, leading to cell migration and invasion in PDAC . In this study, we revealed reciprocal suppression between MALAT-1 and miR-200c-3p expression and clarify the underlying mechanism. Finally, we found that MALAT-1 and ZEB1 was negatively correlated with miR-200c-3p transcript level of PDAC tissues. And there was a positive correlation between MALAT-1 and ZEB1 level. Survival analysis reveals that both MALAT-1 and miR-200c-3p levels are independent prognostic factors. MALAT-1 (high)/ miR-200c-3p (low) correlated with shorter OS for PDAC patients. Interestingly, Li Q et al. showed that MALAT-1 levels were lower in most endometrioid endometrial carcinoma tissues than in normal tissues, while miR-200c-3p levels were higher. Therefore, different expression model of MALAT-1 and miR-200c-3p in human tumor entities needs further mechanism researches. In summary, our findings firstly revealed a novel feedback loop between high MALAT-1 and low miR-200c-3p (Fig. 10). MALAT-1 could function as a miRNA sponge to attenuate miR-200c-3p function, leading to ZEB1 upregulation in PDAC. On the other hand, miR-200c-3p inhibited the level of MALAT-1 expression in a way similar to miRNA-mediated silencing of target genes. Targeting the feedback loop between high MALAT-1 and low miR-200c-3p will be a novel therapeutic strategy for PDAC. Meng Zhuo, Cuncun Yuan and Ting Han contributed equally to this work. We sincerely appreciate the patients who participated in this study. This study was supported by the National Natural Science Foundation of China (grant nos. 81502017 for Feng Jiao, 81502018 for Jiujie Cui and 81572315 for Liwei Wang). The funding bodies had no role in study design, data collection and analysis, decision to publish, or preparation of the manuscript. MZ and FJ carried out the cellular and histological studies, the statistical analysis, and drafted the manuscript. CY collected tumor tissues and followed up patients. TH and JC helped perform the cellular and histological studies. FJ and LW participated in designing the study. All authors read and approved the final manuscript. This study was approved by the Research Ethics Committee of Renji Hospital, School of Medicine, Shanghai Jiaotong University. Written informed consent was obtained from all subjects.